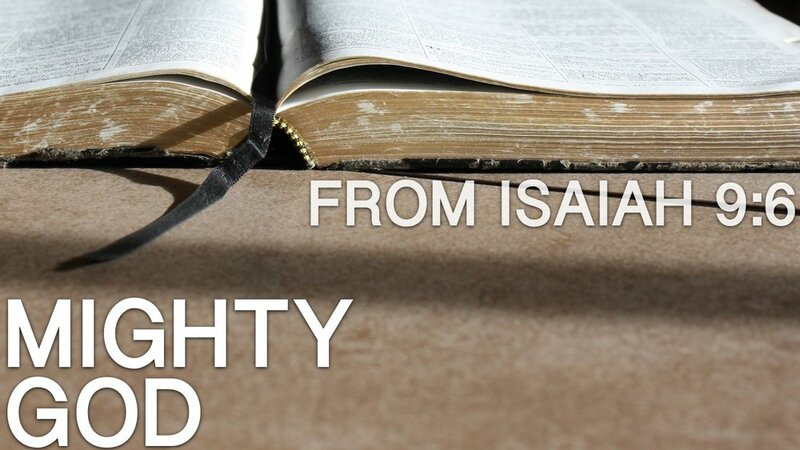 It's interesting that Isaiah would give the Messiah this title. Starting as a child growing up into a man, Jesus never had the appearance of the "mighty God." In fact, He specifically gave that up, in order to become approachable for us. He didn't come in a flashy or kinglike entrance. He didn't flaunt His status. He didn't barge into the king's courts demanding a hearing. He even refused worship from the crowds, except for His final entry into Jerusalem. He certainly didn't flaunt His Mighty God status. Yet, He is is our Mighty God, isn't He? He comforted, healed and lifted up the hurting. He brought the dead back to life. But He sure was mighty. And, that's how God often works, isn't it. God told Him to stand at the entrance of the cave he was in to meet with Him. but the Lord was not in the wind..."
but the Lord was not in the earthquake..."
but the Lord was not in the fire..."
"And after the fire the sound of a low whisper. And when Elijah heard it, he wrapped his face in his cloak and went out and stood at the entrance of the cave. And behold, there came a voice to him and said, 'What are you doing here, Elijah?'" I don't know about you, but I look for God in the spectacular. And He can often be found there, just as Jesus did do spectaular things. But, God is also (and dare-I-day more often) found in the small things. In the regular, everyday life. Because, just as Jesus looked like a simple man, and had no mighty appearance about Him in His first coming on Christmas Day - God often shows up in our lives in subtle and "small" ways. I'm by no means saying He's not mighty. I'm just saying that "mighty" isn't always what we expect it to look like. Because, just as Jesus came as a baby, "meek and mild", yet was "Mighty God" from day one - the Mighty God has big plans for you and I today - but we might miss them if we expect them to come in big packages. God's salvation plan and entrance into our world began as a small baby. because God's biggest plans often start in the smallest packages.